An article posted yesterday by Inman News has industry Facebook groups talking today. The piece, which is clearly labeled in the Opinion category, has prompted Realtors and managers alike to post responses and rebuttals. Titled “Why a real estate license empowers women and could change your life: Even one transaction could be worth it,” the article (written by Stefani Markowitz Berkin, president of Charles Rutenberg) is drawing criticism from both men and women. Dissenters appear to be offended by both the tone and the content of the article as well as its intent, which some are accusing to be a recruiting tactic posing as news content. The author herself pointed out in the comments to her story, “I run the fastest-growing, 100% commission real estate brokerage in NYC,” which does lead one to believe that persuading women to join her company, which appears to charge agents a hefty monthly fee as well as transaction charges, might have been the goal of the article. In any case, I have to admit that I opened the article yesterday and didn’t make it beyond the first few paragraphs because it felt very dated and sexist, as well as offensive to me as a woman who has built a successful career in an industry I’m proud to be a part of. But, waking up to a firestorm of comments and Facebook Live commentaries prompted me to revisit it. “Every woman should have her real estate license. Be a referral agent, or just do one deal; it’s always worth it. Even if you never thought once about this business, a real estate license can change your life. Many times, the value comes when you’d least expect it. And by that I mean when a woman is on her own, unexpectedly, that’s when real estate can be a life-saver. In our business, we meet a lot of people who are buying a house because they found the person they want to share their life with, and dream of a home where they can raise a family. 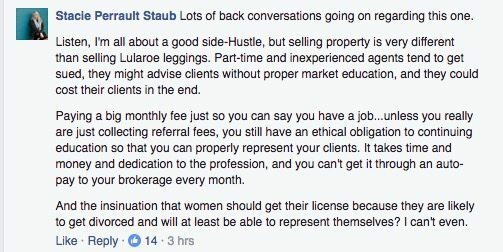 “Listen, I’m all about a good side-Hustle, but selling property is very different than selling Lularoe leggings. “Part-time and inexperienced agents tend to get sued, they might advise clients without proper market education, and they could cost their clients in the end. “Paying a big monthly fee just so you can say you have a job…unless you really are just collecting referral fees, you still have an ethical obligation to continuing education so that you can properly represent your clients. It takes time and money and dedication to the profession, and you can’t get it through an auto-pay to your brokerage every month. So many things about this piece and the way it was written and presented just rubbed the wrong way. Emmy Simpson said, “What a load of horse crap. So now I’m just a hobby Realtor? Coral Gundlach said, “I was dismayed at this article. It cheapens our profession, encourages part-timers and people only in it to make a quick supplemental income. “Again, as others have said, a side hustle is fine, but actively trying to trick anyone, and especially women only that this is a ‘great way to pay for private school.’ Or something to do with your time now that kids are grown is absurd. “She doesn’t mention any of the expenses, time, effort, training, juggling of time and responsibilities. She makes it sound like you just get your license and magically sell a house or two a year and pocket 30K. Here’s the thing. I’m sure this was written with the best of intentions. I’m sure Ms. Markowitz Berkin didn’t mean to offend anyone, and I’m sure that her model works really nicely for her and her agents. “For all you sociable women out there who are longing for a profession where you can enjoy meeting new people and have the ability to earn a little bit or a lot, from the bottom of my heart, I very much recommend looking into the business of real estate and taking the first step to study for a license,” Markowitz Berkin writes. Stacie Staub is the Founder + Owner of the very recently established West + Main Homes, a Colorado-based collective of Real Estate professionals.